The new cadet barracks project at West Point is a new building for the U.S Military Academy and a key project in the plan to achieve a net zero energy campus. 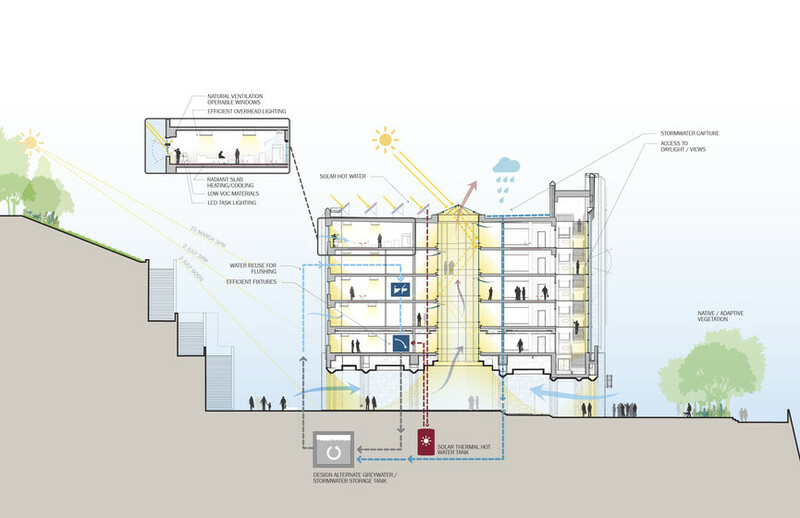 By integrating efficiency measures such as a high-performance envelope, radiant heating and cooling, and a major solar hot water installation, the project seeks to radically minimize energy consumption and be a demonstration project for future facilities. As a consultant to STV’s in-house sustainability and engineering team, Atelier Ten provided LEED review and expert technical support, in close collaboration with U.S. Army Construction Engineering Research Laboratory (CERL), to achieve and exceed the environmental ambitions of this ambitious 650 bed project. Atelier Ten provided design guidance and analysis to optimize and integrate comprehensive energy efficiency measures as well as water and storm water management strategies. This work included evaluating Passive Haus level building envelope strategies and their integration into a contextual granite cladding with high security requirements. Atelier Ten also provided consulting on the mechanical system options and detailed condensation and energy studies to support the engineering of the floor based radiant heating and cooling system. Using custom developed optimization software, Atelier Ten also optimized the entire solar hot water system sizing to meet federal mandates and provided guidelines for future net-zero renewable strategies on the project.